Blake Michaleski's life-long love of boating and fishing started when he was growing up in South Louisiana. From the bayous and backwaters of the Atchafalaya Basin to the brackish waters of Grand Isle, fishing and boating became a major part of life for Blake. While pursuing and completing a Bachelor's degree in Meteorology from the University of South Alabama, Blake fished almost exclusively in saltwater, using his weather knowledge to his advantage, especially when venturing out into the blue water. 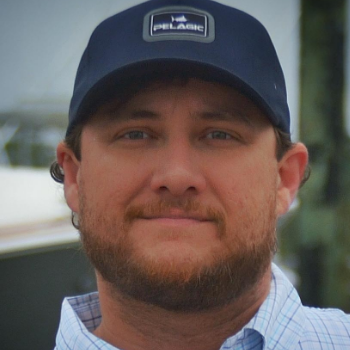 After a few years working in the Situation Unit for the Deepwater Horizon Oil Spill Response generating oil recovery maps and weather contingency planning, Blake found himself working in the recreational fishing industry. Working at the famed J&M Tackle in Orange Beach, AL for several seasons, Blake was able to rapidly advance to dealing with the top tier of bluewater anglers, captains, and boat owners. During this time Blake developed a strong affection for custom sportfishing yachts and offshore center consoles. Having the opportunity to fish on many different boats gave Blake the chance to get very familiar with some of the very best fishing boats on the water. He is very knowledgeable about different building techniques, propulsion machinery, systems, and of course tackle outfitting. Blake enjoys fishing with his tackle and yacht clients, affording him the opportunity and privilege to share what he has learned with others. Outside of boats and fishing, Blake is the father of two girls and enjoys working on his classic Chevy truck project.